Rich Steinberg of BMW says many towns are slow to approve permits for home chargers because it's a new issue and there's no standard procedure. It's not as easy as plug, charge, unplug and go -- a lesson Mini learned at the onset of its U.S. electric car trial. It took Mini up to seven months to get all the local approvals and proper electrical hookups for the 450 lessees of the Mini E electric car. The pilot test project began in April 2009 and was scheduled to end this summer. But participants can choose to continue for another year and then lease a second electric car that parent company BMW will put into a trial in 2011. The participants are in New York, California and New Jersey, where parent BMW of North America is based. Before any lessee could drive the Mini E, a 220-volt charger had to be installed in the lessee's garage -- and that's where the problems began. Mini thought installing the required high-voltage charge box would take about 30 days from the time a lessee took delivery of a car. In California, which has experience with electric cars, some of the municipalities approved the necessary permits in days. But the process was considerably slower elsewhere. "There are 30,000 municipalities responsible for permits in the U.S.," says Rich Steinberg, manager of electric vehicles operations strategy for BMW. "Some had never seen a permit for an electric car, and some had arcane rules." 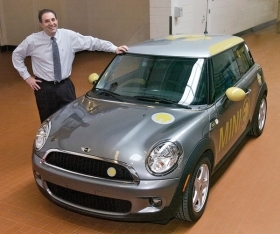 What confounded some locals most, Steinberg says, was the Mini E's lack of UL stickers -- issued by Underwriters Laboratories Inc., which evaluates product safety. The UL approvals didn't come for more than three months after the pilot began because Mini shipped the cars with European plugs rather than U.S. plugs. Some inspectors didn't care, but others were adamant about the stickers, Steinberg says. The first step on the residential level was a site inspection of the home with the vendor and the subcontractor who would install a fuse box to handle the 220 volt/40 amp current needed for the Mini E to charge quickly. "They had to determine where there is extra capacity," Steinberg says. "If the house has a Jacuzzi, washer/dryer and a pool, there was usually a new fuse box panel that could handle it." Generally, those who lived in older homes didn't have the necessary electrical capacity and needed a new fuse box panel, he says. The fuse box also had to be less than 35 feet from the garage. Mini footed the bill for the box and standard installation. About 25 percent of the lessees had problematic installations -- including panel upgrades that cost up to several thousand dollars, Steinberg says. Mini E drivers living in condominiums and apartments were an even bigger challenge. "You wanted the energy to be billed to the condo owner's electric meter -- and it wasn't always close to the assigned parking space," Steinberg says. Moving spaces and installing charges involved negotiations with condominium associations, he says. In New York City, where apartment dwellers have no personal garages, Mini made arrangements with two major parking garage operators. Based on charging at a utility's full rate, the cost of driving the Mini E is about $6 (about 5 euros) to travel 100 miles (about 160km) -- the range of the car on one charge, Steinberg says. That's based on 20 cents per kilowatt hour, he says. But it's still half the cost of the equivalent gasoline trip with gasoline priced at $3 a gallon. Many utilities discount electricity after 10 p.m. The cost drops to 10 cents per kilowatt hour -- about $3 for a 100-mile trip. Mini covered the cost of most servicing and paid for insurance. Steinberg says Mini does not cover brake replacement, and drivers need to step on them more often to regenerate power back into the battery. During the trial, no one needed new brake pads. Steinberg says most lessees said a 100-mile range was adequate, allaying one of the worries Mini had. The exception was in cold weather when the battery range is reduced by 20 percent to 30 percent. Batteries operate with internal friction, and cold weather slows down the process, he says. Mini didn't install heaters but offered to install a charging station at the work location of any lessee who wanted it. "Only a handful" took the offer, Steinberg says. • It's difficult to get permits for 220-volt chargers. • Hot/cold weather limits range. • Brake pads may need changing. • There's no rear seat or trunk. BMW will launch its second electric trial with the four-seat, four-door ActiveE based on the 1 series in 2011. Any lessee who wants to go into the ActiveE trial can hold onto the Mini E for another year, Steinberg says. So far about half the Mini E drivers have agreed. The ActiveE pilot also will be run in New York, New Jersey and California. Mini will add markets and states, although those haven't been chosen, Steinberg says. The ActiveE has new battery technology from Samsung and Robert Bosch that BMW will use in its first production electric car, known today as the Megacity Vehicle. That car goes on sale in 2013 and will have four seats.